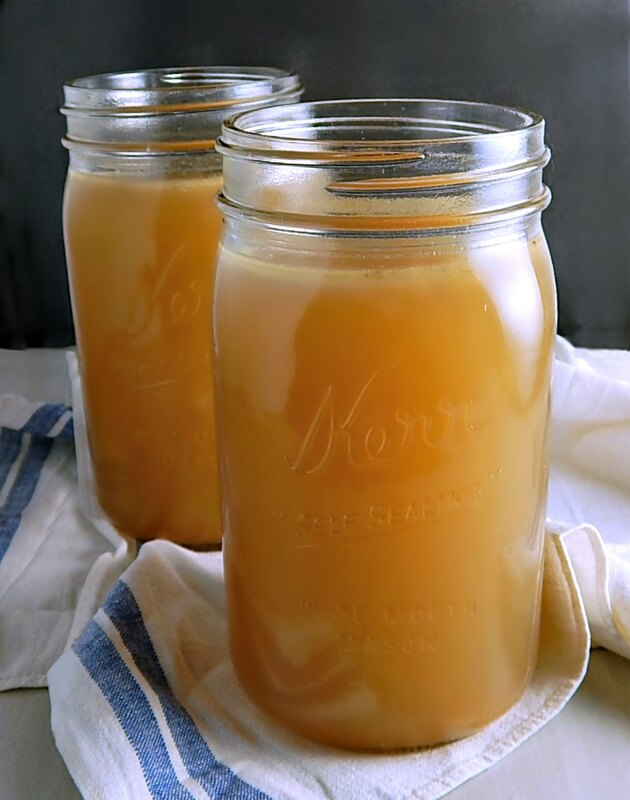 I love, love, love to make my own homemade Chicken or Turkey Broth. For years, I made my own then I went through a period of time when I just stopped. A visit to my daughter’s house reminded me what a difference a homemade stock makes, not only in soups but in so many recipes. And while I don’t mind cheating with a boxed or canned or Better Than Bullion now and then, there are some recipes I wouldn’t even think about making without my Best Turkey Broth or Chicken Broth. It’s the stock make every time we have turkey, and it’s the same recipe I use for my Chicken Stock, too. There’s nothing like a pot of soup simmering on the stove during a cold, snowy day, is there? Or a drizzly Spring day, or even a crisp, crunchy leaves Fall kind of day. So I love to make a big pot of stock from my turkey bones and divide up to freeze. Then I can make those soups anytime I want. If you want, just jump to the recipe and go for it, but if you want to know all about turkey (or chicken) stock, the best way to make it and how to use it then read on, friend! You can see that my Best Turkey Broth or Chicken Broth is a gorgeous thing – even if admittedly, I need to get better and more pics! It has a deep, rich color and a good “gel” or “body.” That gelling is the hallmark of the best stocks & broths. Some people call stocks “bone broth” which is a term that came from the Asian side of cooking (so no, it’s not just an annoying made up & redundant term) and the name has caught on especially with the Paleo movement. In reality, Bone Broth is just stock, in case you are wondering. For years, the terms broth and stock were used pretty much interchangeably; these days most people think of “stock” as being made from bones and “broth” as being made “meat” but that’s a fairly recent differentiation. So when I posted this recipe, it was named broth. Regardless, in this recipe, the great gel comes from all the marrow, bone and collagen that breaks down from the long, slow cooking process. Don’t be surprised when you open your refrigerator door the next day and your lovely stock looks like jello. While that doesn’t sound so good, it’s supposed to be that way. It will liquify again as it’s heated. My Best Turkey Broth or Chicken Broth also has tons of flavor. There’s the flavor of the stock itself, from the bones, collagen, and marrow and there’s also the flavor of the aromatics and spices that go into the stock. Depending on how you’ve cooked your turkey or chicken, there may be different flavors from liquids you’ve cooked in, rubs that have specific flavors and any herbs and spices you’ve used. All that flavor will be passed right into your stock, too, both from any meat clinging to the bones and the juices & drippings and scraps you use for your stock. I give some thought about how I flavor and cook my turkey (and chicken) & I don’t generally go for wild or off the wall flavors, just classic goodness. How that turkey or chicken is cooked will affect the flavor of the stock, and also any soups made from the stock. It will slightly affect the flavors of any recipes made from the leftover meat, too. This is a good place to plug my post, 12 Days of Turkey. It started out as a dozen recipes but has grown over the years to over 40 recipes on my site that rely on either cooked chicken or turkey to start with. For the most part, I just roll with and appreciate all the subtle flavor nuances and any appreciate the homemade goodness of my stock & the soups made with it. Unless you go hog wild with some kind of super intense flavors, your stock will work in just about any soup. Sometimes, though, I’ll make a soup that actually plays up the specific flavors from a particular dish. For instance, when I made my marvelous Sunday Roast Chicken with the Lemon & Garlic variation, I love to use the bones and a little of the leftover meat in either my Chicken & Rice Soup which has a bit of lemon in it, to drive that flavor home or in my Italian Wedding Soup because a bit of lemon just compliments all the flavors. When I make my No Rotisserie Rotisserie Chicken, and I use a heavy hand with that marvelous rub, I really like to use the stock and any leftover meat clinging to the bones for my Barbecue Chicken Chili. I’m pretty sure I originally “stole” this recipe from Cook’s Illustrated and one of their posts for using up a turkey carcass. I’ve altered it a lot over the years and kind of made it my “own” as they say. This recipe is known as a “white” or a “blonde” stock, even though it’s not really either white or blonde. The resulting broth for either turkey or chicken is really spot on perfect. It’s just a beautiful thing. One taste will convince you! I use all the bones I can when I make my Best Turkey Broth or Chicken Broth, as well as any scraps, fatty pieces, skin; anything that has flavor, especially any drippings and gelatinous stuff from the pan the turkey or chicken was cooked in, unless, of course, I’m using those drippings for gravy. It might shock you that sometimes I just toss in any bones off the plates as I’m cleaning up…I know it’s a bit cray cray, but I’m going to be simmering my stock for a long time so I’m not worried about any germs and our family is one of those that eats with a fork and knife. In end, you’ll want to skim off any fat that floats to the top of your stock anyway preferably after an overnight stay in the fridge, so it doesn’t matter if you start out with some of the fattier, scrappy pieces. When the stock congeals, it will form a layer of fat on the top that’s easy to either just pick up or spoon off. You might hear that is called Schmaltz and you can save it in the fridge or freezer and cook with it if you wish. It’s traditionally used to make the wonderful Jewish Latkes. You know how good duck fat fries are? Chicken fat fried potatoes are every bit as delish! There is an easy variation to make your Best Turkey Broth or Chicken Broth, and that is to roast your bones, first. Then it’s called a “brown” stock. If you’d like to, it’s simple. Crank your oven up high, to about 450 degrees. Add your bones to a sheet pan and toss them in. For the best flavor, really roast them until they are nice and dark, turning once, almost to the edge of too done. When you toss those bones in the pot, don’t leave any of the flavor behind. Use water to deglaze the sheet pan, scraping up every bit of dark and/or gelatinous sticky stuff or crispy bits and pour it into your stock pot. I’m frugal and try to cut as much meat off the bone for other uses as I can. You’ll never get all the meat off and it can be surprising how much meat is left on the bones. While sometimes that meat is full of cartledge or discolored, as the soup simmers, the meat releases and it’s really the tastiest part of the turkey or chicken. After the bones has been simmered for a while and all that meat has softened up, if time allows and I’m thinking about it, I’ll remove the bones and pick off a lot of that remaining meat before it spends too much time in the stock, maybe at an hour into the simmering process, then I toss the bare bones back in. If there’s enough meat (it won’t be nice pretty pieces like you’d want for a sandwich) I might make a casserole or other recipe with some of it and save some for my final soups, but that really depends on whether you’re using a turkey or a chicken. Chances are with a chicken, you’ll end up with just enough meat for your soups. You might want to check out all my soups, on my menu for Soups, Chowders & Chilis. Just a few are featured here. I feel good knowing that what I’m making or serving doesn’t have a lot of additives or strange ingredients. Ever looked at the ingredients in any store bought stock? Yeah, I know, right! Making your own stock will help you avoid a whole host of strange ingredients! I have a set recipe that I use for my stock, but not one that’s set in stone. I use carrots, celery, and onion along with a few peppercorns. I also have a couple of secret ingredients I like to use, and one is marjoram. It’s not an herb I hear of people using often, but it is magical with chicken or turkey. If I have them around, or remember to buy, another is a turnip or rutabaga. A small one or a part of one. Scrub off any waxy coating on the skins. You might not use many turnips or rutabagas, but they give an absolute heavenly flavor (and color) to your chicken stock, and you’ll probably never guess what it is. A surprise secret ingredient is a piece of fried chicken. I know it’s crazy but I tossed in a fried chicken wing one time (we don’t usually eat the wings…wasteful, I know, but I keep them in the freezer for my stock) and that stock was some of the most incredible I’ve ever made. Turns out there’s a precedence for this; I read about an old French recipe for stock that used roux (flour fried in fat – which is basically what the outside of the fried chicken is) just like so many recipes from New Orleans. Here’s my recipe for Dark or “Red” Roux if you’d like to read more about Roux. When you make your stock, you can use every bit of the vegetable. Wash the whole thing first and use the bottom and ends of the celery, the tops of the carrots, the skin of the onions. It’s all flavor. Usually, when I use the celery, I’ll just pull out the sleeve and chop across the whole celery and use all of the leaves from the package. Herbs I’ll use fresh if I have them; if I don’t, I always save some stems through the summer in my freezer to add to my stocks. My best stocks are always made from the scraps of veggies I’ve saved through the week or added to a bag in the freezer, rather than whole veggies I cut up. These smaller scraps add so much flavor and make a much better stock – plus you’ve eliminated a lot of waste. In go the celery tops or bottoms if they’re in good shape. The peels from carrots. The skins and ends of onions – those skins add beautiful color to the stock. Because these items are already broken down they really give up a lot of flavor and color. Many frugal cooks do this, it doesn’t save a ton of money but it does add a ton of flavor for pretty much no cost and eliminates so much waste. You pay for it, you might as well use it, right? Those aromatics also float on top of the soup, making a “raft” and they naturally clarify the broth, much like consomme is clarified by egg whites as the stock percolates through it at a slow simmer. You’ll want to skim it off before straining your soup, but the bonus is that you won’t have to do any skimming to speak of during the actual cooking process. As far as the wine, sometimes I add it, sometimes I don’t. The acidity in the wine is supposed to help break down the bones and marrow, and I generally add it only if I have leftover wine. Sometimes I add just a hint of vinegar or lemon instead. A little bit of acidity in this soup isn’t just for their chemical use to help break down the bones and marrow; a touch of acidity brightens up the soup. You won’t use enough to taste it, just enough to enhance it. First of all, an important safety note: Chill your stock as soon as possible, preferably in several metal containers, (which cool faster) and containers that are shallow, lid off or ajar so it cools faster and then cover when cold. Don’t take a large amount of stock in your hot stock pan and stick it in the fridge. You will often (even from professionals) see people advise to let the stock cool to room temperature and then refrigerate it. This is WRONG, WRONG, WRONG and a gross mistake. It’s stupid wrong and dangerous and makes me angry that they are putting people at risk with outdated information. They are concerned that the stock will heat up the refrigerator and cause dangerous temperatures. For the amount of stock most home cooks make, and certainly the amount in this recipe, which isn’t even close to the amount restaurants make, the quantities are NOT enough to heat up our modern, efficient refrigerators to a danger zone. They aren’t ice-boxes for goodness sake. Hot stock cooling on the counter is an ideal breeding ground for all kinds of nasties to grow in. So is a huge pot cooling in the fridge. Keep your stock for three or four days (just to be on the safe side) and if you’d like to keep a bit longer, reboil it and/or freeze it. Be aware freezing halts the growth of bacteria, it doesn’t kill it, and once unfrozen as soon as it gets to the right temperature, those critters will love it and multiply like rabbits. Keep your stock out of that “danger” zone, 40 degrees F. to 140 degrees F. as much as possible. Turkey Ramen – and thanks to my son’s lovely girlfriend for hand modeling! Thanks, Tweetie! You’re always going to have a variable in the exact amount of stock you’re going to get when you make your Best Turkey Broth or Chicken Broth. The intensity of flavor might vary, too. If your stock is really intense, you can cut it with a bit of water until it’s just right, or if it isn’t souper (sorry) flavorful, it can be simmered and reduced. When I make my Best Turkey Broth or Chicken Broth with turkey, I usually have quite a bit of stock, several quarts and a good amount of the meat from the bone. With Chicken, I usually have more than you’d think, usually enough to make two soups. Because it simmers so long it’s generally more flavorful than recipes where you start with a raw chicken in the pot, cook it until it’s done, and then proceed with the recipe. That means you’ll have more good, tasty broth to use with this method. I like to divide the stock and meat up and freeze it in quart bags so it’s ready to go for any soup I make later. I label them first, then lay them flat on a sheet tray after they’re filled. When frozen, they can be easily stacked. Some people use ice-cube trays but I just think it’s an extra step, takes up too much room, and leaves a lot of edges exposed to freezer burn. In my freezer, they tend to meld together after a bit of time, then I have to pound them to break them up if I want a specific quantity. Worthless. If you want to reduce your stock for storage, figure out how many quarts you have (after you’ve adjusted for taste if your stock is strong, by adding more water or if weak by reducing a bit) so you know how much to put in your freezer bags. If you start out with 6 quarts, you could reduce it down to six cups, for instance. Label the bag so when you pull it out of the freezer a year later you know what you’re dealing with. In this case, each cup of stock equals 1 quart but you need to add water to make that quart. Since 4 cups are 1 quart, you’ll need 3 cups of water. Label something like 1 cup turkey (or chicken) stock – add 3 cups water to make 1 quart. When you start cooking soups made with turkey or chicken broth, you’re going to notice that some recipes have you start out with a whole chicken, like in many Chicken & Dumpling recipes. Usually, you are directed to cover the chicken with water by about an inch and simmer it. That generally is about 12 cups (3 quarts) of water although that can vary a lot depending on how large that chicken is. It’s a pretty standard amount of liquid, though, for many of the old school recipes that call for cooking the chicken to make the stock the stock. The more frugal way to stretch the chicken or turkey for those recipes, though, as I mentioned above, is to make up your big pot of stock then use the 3 quarts of that stock (and a good amount of the chicken or turkey if using) in these kinds of recipes. Other recipes will call for a set measurement of stock, and will usually call for anywhere from six cups (1 1/2 quarts) and up to the 12 cups (3 quarts). Some recipes are adapted to use the amount of stock you get from a can or a box of stock. Thaw out the amount of stock you need, add the water if you’ve reduced it and pour the rest of the thawed stock in a fresh Ziploc, label it with the amount and re-freeze it. It’s perfectly safe to refreeze stock. You can then accumulate several smaller bags to combine for another soup or maybe use in another recipe that uses just a bit. If you have standard recipes you like to make all the time, measure the Best Turkey Broth or Chicken Broth out in the right amount before you freeze it and you can get pretty specific and not have little bits of stock leftover. For instance, I might just measure out the exact amount of stock I need for my Chicken (or Turkey) Tortilla Soup, 6 cups, and then label the freezer bag “6 cups of Chicken (or Turkey) Stock for Chicken Tortilla Soup.” If you’re reducing the math can harder but it doesn’t need to be exact. 6 cups are 1 1/2 quarts, so if I’ve reduced each quart to a cup, I need 1 1/2 cups of the reduced broth & a note to add in the 4 1/2 cups water. Making your own stocks, especially making the stock by itself to divvy up for different recipes rather than using the whole chicken or the stock made from your turkey or chicken bones for just one soup is always a lesson in frugality. And of course, especially if you’re using vegetable scraps. Even if you don’t have the scraps on hand, most of the basic veggies for a stock, onions, celery, and carrots are dirt cheap and often in (at least in mine) the fridge. What you’re really doing when you are making Best Turkey Broth or Chicken Broth is not just about frugality, it’s about quality, too. You just can’t beat the flavor of a soup made with homemade stock. And yes, you can buy stock, but yanno what? It’s pretty darned pricey, at least for a good one, and even a good one doesn’t approach the taste and body of homemade stock. Plus, isn’t it nice to know that you’re using everything you’ve paid for and not just wasting it? I’m old, often tired, and I find sometimes it’s just easier to make the Best Turkey Broth or Chicken Broth in a two-part process. I’ll simmer it away, give it a strain and refrigerate it, along with meat or bones I need to pick until the next day. It’s a simple process to defat the soup after the fat rises to the top and thickens from the cold and the chicken is so much easier to handle once it’s cold. I’ve been asked a few questions about making Best Chicken or Turkey Broth over the years. One is about flavor and the bottom line, for the best flavor, simmer for as long as you are able (within reason) and two to three hours is kind of a minimum. I’ll simmer it for about six hours if I’m around the house. And even more importantly don’t boil your broth! Just bring it up to a boil and then reduce it to a simmer immediately. Boiling will harden the marrow inside the bones and make it hard to extract. The other concern is gelling. Some people are concerned when they see the soup gel in the fridge because they’ve never seen or made homemade soup. It’s all the collagen and it’s supposed to be that way. Your soup will turn back into liquid as it heats back up. If your soup doesn’t gel or isn’t rich with at least good some body, you’ve either boiled it too hard and/or not simmered it long enough, or you just have too much water in it. The bit of acid in the recipe does help with getting a really good gel. Bring all ingredients except parsley & marjoram to a boil in a 12-quart stockpot over medium-high heat, then immediately turn down to a bare simmer. Continue to simmer, uncovered, for at least two to three hours and up to six; look for a few bubbles to slowly rise to the surface every now and then. If you have used the vegetable trimmings (see note) instead of or in addition to whole veggies, there will be no need to skim the broth. If not, skim any foam as it rises to the surface. If there is a lot of meat left on the carcass, pull bones out as soon as the meat has softened enough to easily remove from the bones, usually about 45 minutes to an hour into the cooking process. Remove the meat and refrigerate it. Replace the bones and continue to simmer. Add parsley and marjoram about at about two hours before you plan to stop cooking then continue to simmer till stock is rich and flavorful, about 2 hours longer. When finished, strain stock. Cool stock about 20 minutes, skim fat from surface or divide up into containers and cool, then skim fat after it has hardened on the surface. Use as a base for soup or portion and freeze. There is no salt in this broth, add to taste when finished. Using vegetable trimmings: save up the trimmings from any carrots, celery, and onion (skins and all) and use them to make a “raft” across the top of the soup. They will naturally clarify the soup. Watch the soup for liquid level, especially when simmering a long time. Safety: If you make large amounts of stock, cool it quickly by putting in smaller containers in the fridge, uncovered, until chilled. Metal bowls help the heat dissipates faster. Broth keeps well for about three to four days. If you haven’t used it or frozen it by then and it still seems fresh, bring it to a rolling boil before using. This entry was posted in Click here for Fabulous Food Posts and tagged Chicken, Chicken Stock, Cook's Illustrated, Freezes Well, leftover Chicken, leftover vegetables, Leftovers, planned leftovers, Soup, Turkey, Turkey Leftovers. Bookmark the permalink. Thanks, Allison, and I appreciate you stopping by to comment. I often add a spoonful of apple cider vinegar – it doesn’t really affect the flavor, but does help draw all the goodness out of the bones. You’re a genius and thanks for sharing! I love learning new tricks and tips. Wonderful. I am going to try making turkey stock this year.